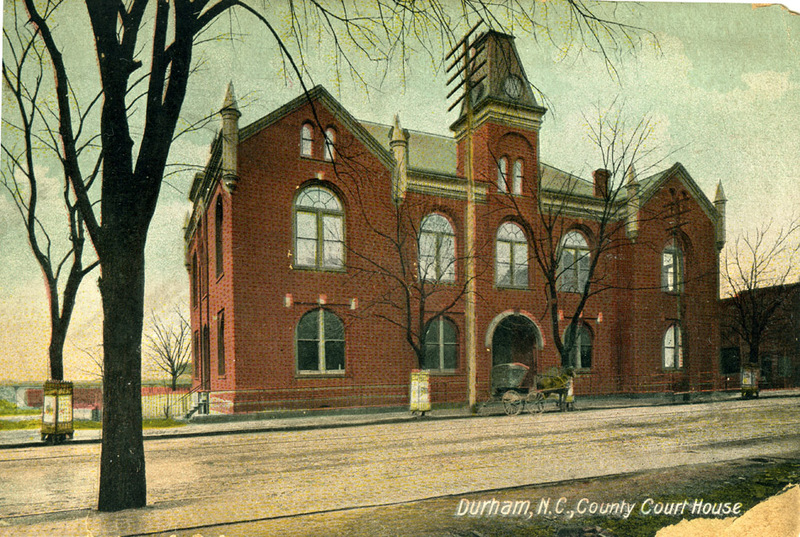 After Durham County was established by vote of the state legislature in 1881, the first courthouse (and everything else related to the business of the new county) was located in rented space in Stokes Hall, on the northeast corner of Corcoran and West Main St.
Evidently, prisoners were soon singing and calling to passersby - an early complaint, dating at least to 1885, was voiced when a woman wrote the city complaining of the "profanity and lascivious language." As a result (and at her suggestion), a 10 foot high fence was erected around the property. 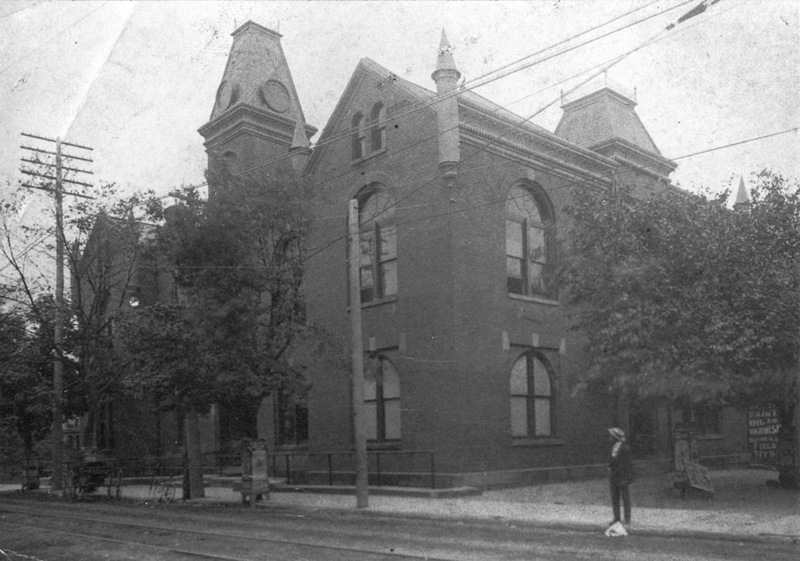 By 1889, the county hired Byron Pugin, who had built the Day house on Ramseur St., BN Duke's 'Terrace', the Parrish building, and other early structures to design the courthouse. The initiation of construction was a major event - EJ Parrish's light infantry, the fire hose companies (both African-American and white), all of the movers and shakers, and, of course, the Masons, who performed the "ritual anointing of the cornerstone with oil, wine, and fruits of the field" per Anderson. A convict crew performed the excavation and much of the construction labor, and the brick for the structure was evidently "fired at the County poorhouse." First County courthouse, looking south-southwest from East Main St. 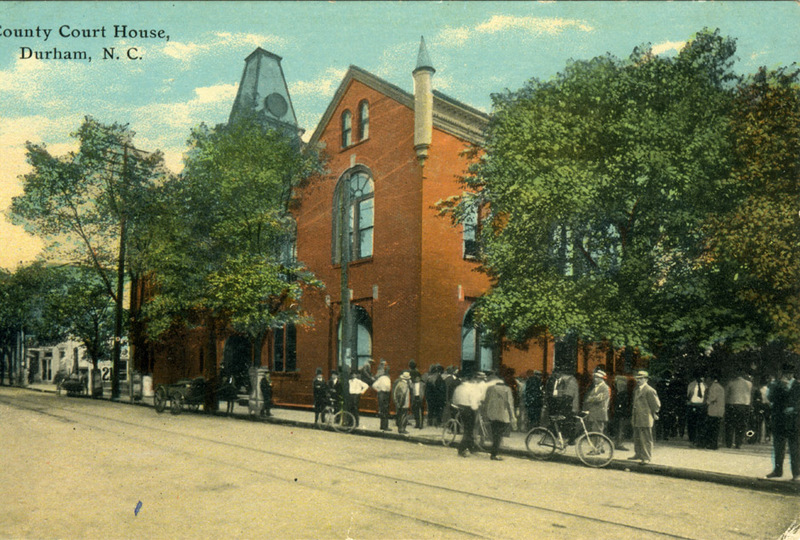 Looking east from the corner of Church and East Main, with the first courthouse on the right, 1890s. 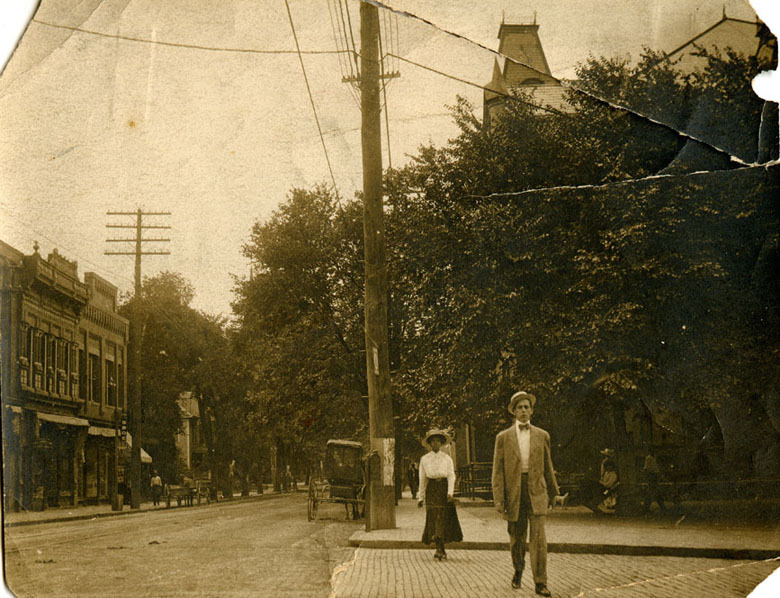 Looking southeast from East Main St.
By the mid-1910s, space was again at a premium, and the county issued bonds in the amount of $336,466.76 to build a new courthouse. 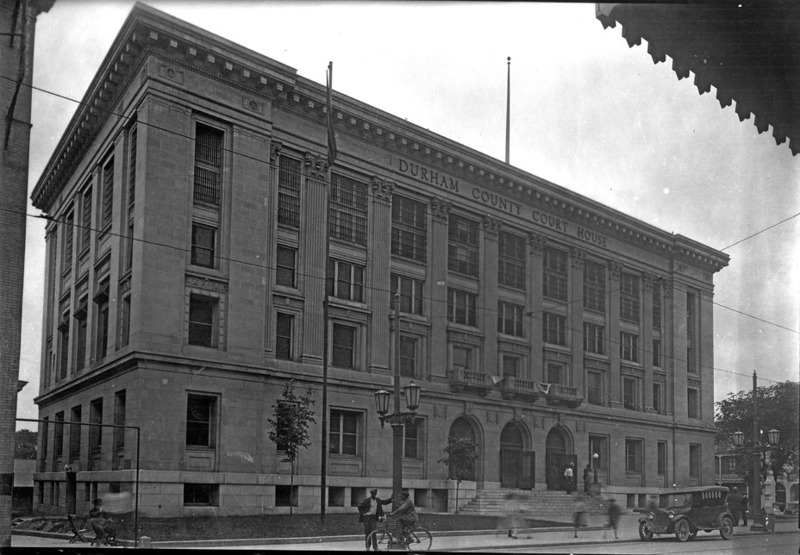 A new neoclassical structure was design by Milburn and Heister to replace the older courthouse on the site. In 1916, another groundbreaking ceremony was held, in which the contents of the original building's cornerstone were placed in the new cornerstone (along with additional items) and the cornerstone was again anointed by the Masons. The jail was located on the top floor of the structure, from which point the prisoners would shout at people passing on the street. Looking southeast from the northeast corner of Church and East Main., 1940s. In 1978, that courthouse was completed, and, perhaps because it really was too small to contain the various necessary offices, the 1916 courthouse was retained, and it continues to hold various county offices today. The prisoners no longer shout from the top floor, but I'm still hopeful we can get that effect for the patrons of our new Performing Arts Center.